I have always liked 2-Player 1 Keyboard style games, so I thought I'd make something kind of cooperative that I could play with a friend or something. 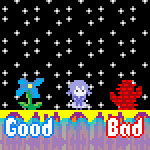 I haven't really ever designed any levels for a game that I've made before, so it's fun doing trial and error sort of situations of what is fun and what is too difficult. I am also wondering how important is difficulty in games in terms of accessibility. I always love a challenge, but for the case of a lot of my friends, they wouldn't be able to stand to play something like this for very long. I guess it's an audience thing. The concept of this game is that the two players have to keep this ball in volley while hitting targets with the ball without having the ball leave the screen. I thought it would be a fun game to try to coordinate with another player in order to strategically bounce the ball.